[definition - 'Coiller': a collar made of coils].. of course!! 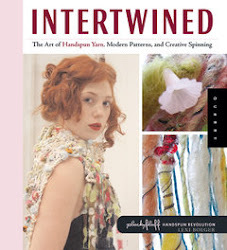 1. a long, thin strip of super-coiled handspun wool yarn or other fibrous material worn about the neck, shoulders, or waist for ornament or adornment. 2. a warm fuzzy neck scarf or belt with dangling ends. 3. when not about the neck or waist, indeed it shall then function as ornamental yarn for a vase, door handle, etc. 4. to coil or wrap or encircle or nuzzle with, or as if with a scarf. Perfect for spiralling around the neck for those cooler evenings, the Coiller sure is some fancy fiber attire draped around the waist too!! Crafted from Wooldancer FunkiFiber Batts, they consist of merino & sari silk fibers, with occasional sparklies & some puffs spun in as well. 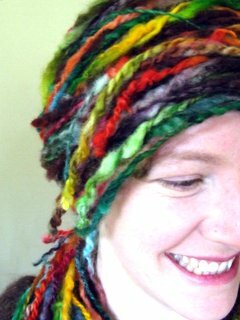 The Coiller is a continuous super-coil yarn with some felted bits & tassel tips - Beeeautiful wearable fiber art! Dizzy Days Coiller will become available in my etsy store in my next fiber update.. pop on the Newsletter & be notified in Advance! yay gorgeous coillars! Very stylish- and versatile. The perfect accessory!